There's another issue of Innovation Edge, our technology preview newsletter, available for your perusal. This brief publication highlights technology previews available to the community. Something people don't always know is that technology previews are free. All we ask is that you try them and give us feedback on your experience. Trying something, liking it or hating it, but not telling us, is the same as not trying it. 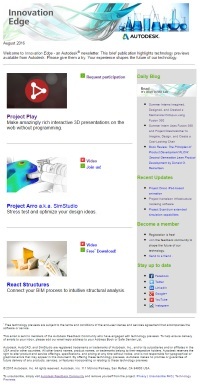 Technology previews have their home on the Autodesk Feedback Community site, the same site that hosts Autodesk Beta projects. Technology previews are open to the community at large and may be discussed publicly. Each issue only features 3 technology previews. For those who sign up for the newsletter by joining the Autodesk Labs project or one of the technology previews, we will not SPAM you to death. You will only receive 6 email messages over the entire calendar year — one every other month. If you would like to peruse past issues of the newsletter, I have created a page on my blog. Thank you for all of the downloads, site visits, email messages, forum postings, blog comments, and social media interactions. The virtual printing press is once again alive in the lab.